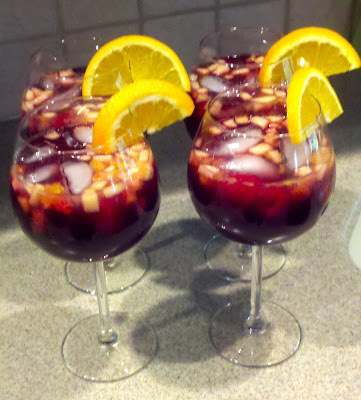 When I was searching online for a sangria recipe, this Red Wine Sangria I found from Bobby Flay got amazing reviews! But... it wouldn't be like me to follow a recipe exactly now would it? So, here's my variation. My apologies, I didn't think to take pictures while I was making it -- but it is really simple to make! In a large airtight bowl, combine wine, liquors, juices, simple syrup, and a couple of cinnamon sticks. Slice 2 oranges and 2 apples, then add to bowl. Refrigerate for at least 24 hours. If desired, remove soaked fruit and cinnamon sticks before serving. Dice remaining 2 oranges, 1 apple, and 2 peaches, and mix in a small bowl with the fresh raspberries. To serve, add a scoop of the fruit mixture to a glass with ice. Fill with sangria and top off with a splash of Squirt.